D: Keep your lousy potatoes away from my comics, woman! That’s “Age of Ultron” by Brian Michael Bendis. K: ::Thousand yard stare across her face:: Foil covered comics…Glory Avengelyne…so much hair…thongs… I don’t know if I can read another book like that. Remember what happened last time? D: This book isn’t like that at all. None of the women are contortionists and there is a real plot to this story. The cover doesn’t matter. If it’s got Bendis’s name on it, it’s going to be good. K: ::looks at the shiny comic book cover:: Is it safe? D: Yes. It is safe. Give it a look. K: Oof. Things are looking pretty grim for our heroes. D: Things are looking pretty grim for EVERYBODY. K: And to tell you the truth, the end of everything never looked better. Let’s see who drew this thing… OH! That’s why this “Age of Ultron” looks so pretty. Bryan Hitch is manning the pencils on this one. Nobody draws destruction like he does. I remember that “Authority” book you tossed my way. EVERYTHING blew up in that book! D: So let’s see what Bendis and Hitch are “blowing up” here. There really isn’t much in the way of story here in part one, but “Age of Ultron” is scheduled to be a pretty big mulit-part book. In fact, it’s been reported that the ending is known by only a select handful of people at Marvel. And they ain’t telling nobody nothin’. K: New York is pretty much beat to crap already on page one. Statue of Liberty is a ruins, the mighty S.H.I.E.L.D. heli-carrier is a crashed and burned ruin. And a squadron of Ultron-bots is patrolling the city! K: ::rubs knuckles on shirt:: But we don’t know how NYC got in this sorry state. All we know is Spider-Man is tied to a chair and getting the crap kicked out of him. D: And Hawkeye to the rescue? K: And Hawkeye to the rescue. D: Arrows! Punches to the chops! Laser blasts smashing through burned out ruble, making more burned out rubble! So much rubble being burned out! K: So then our heroes retire to Avengers Tower, to nibble on finger sandwiches while Jarvis polishes Iron Man’s armor, then? D: ‘Fraid not. Looks like only a smattering of Good Guys are left, hiding out in the burned out rubble (lots of that) of Central Park. Everyone is looking down in the dumps. Spirits are low. K: And the cliffhanger? Yeah, the cliffhanger. EEK. D: Part two came out this week. 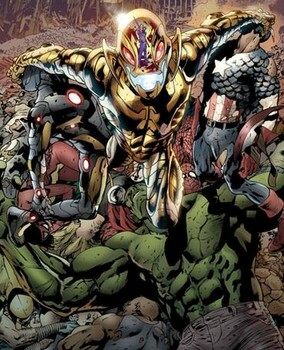 I don’t know where “Age of Ultron” is going, but Bendis and Hitch have set the hook deep. I’m in. D: No, no they don’t. ::closes shiny cover:: So, are you getting over your fear of Foil Covers? K: ::stares off into the distance and shudders:: Someday I might. Someday. But I’ll keep buying them if Bendis and Hitch are making them.